To assimilate in America, one must be anything at all. We’ve never yet learned to fit together. 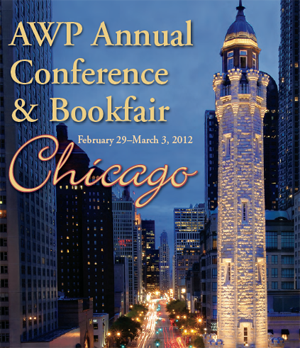 The cover of the AWP 2012 program, courtesy of the AWP. This morning, I woke up in Chicago. As I write this, I’m back in Buffalo. The transition of travel always throws me off my natural axis. I find myself disoriented for days afterward, wandering like someone recently awoken from a dream and not yet returned to the realm of consciousness. Images from the places I’ve seen flash through my mind, intermingling with the familiar sights and sounds of my native city. Pangs of loss for the place I’ve just left hit me at odd moments, homesickness for the landscape I just left. For days after I unpack my suitcase, I don’t live anywhere. I am an immersive traveler. I like to put my headphones in, tune to a song that fits my mood or my surroundings or both. I walk fast, like a local. Crossing streets like I know what lies on the other end of the block. I get lost a lot this way, but I find that when I finally find my bearings, a light switch in the dark illuminating the way, my concept of the city’s organization is clearer, more thorough, than if I blindly followed a map. I don’t frequent chain restaurants. Give me a greasy spoon with a misspelled menu. I’m not interested in tourist destinations, except seen in unusual ways. A friend and I, shut out of two poetry readings, went to see the Bean at 11 p.m., the reflection of the skyline contorted beneath the night sky, the sleepy city a million kinds of quiet. On our last night in town, we drank the house brew at a dive cafe-bar where an SNL skit was filmed, which everyone but the local crowd promptly forgotten. I took the subway home alone, staring at my reflection in the window, forgetting that wasn’t my city. My face blurred in the smudged glass looked at home there. The concrete backdrop suits my after-dark complexion. On Friday, I went to see a friend read at a book release across town for the poetry anthology, “Beauty is a Verb.” After the reading, he looked shocked to see me. “You look completely different from the last time I saw you, in January!” he exclaimed. My nature is chameleon. I like to blend into the background. Study the walk, the speech, the manners of dress wherever I go. In Italy, I wound Italian pashmini around my neck, slipped into dark jeans and high leather boots, wore sunglasses that grazed my cheekbones. In London, I decorated my periphery with Topshop and H&M. In America, it’s easier. We all look the same from far enough away. The Association of Writers and Writing Programs conference I attended was frenetic, inspiring and vaguely unsettling in cycles and all at once. Set in the Chicago Hilton and Palmer House Hilton, the opulence of crystal-chandeliered, brocade-draped ballrooms and conference rooms with gilded wallpaper drew a stark contrast to the subjects discussed. Cinematic Poetry. Trauma in Poetry: Writing the Hybrid Body. Immersion Writing. A Tribute to Richard Brautigan. I sat among my fellow writers and writing students as we perched on rented chairs, notebooks splayed open on our laps, vulnerable as stricken birds. In jeans and tunics and winter clothes, our attire didn’t match our surroundings and it unsettled me. My instinct to blend in doesn’t work when 10,000 people all stand out against the landscape. Or it does, but it turns me into part of a herd, part of the hordes of writers with badges around their necks like talismen against rejection, our names emblazoned on them almost apologetically, distinguishing ourselves from each other by a few letters strung together on necklaces that made us all the same. We are homogenous in our otherness, while distinctly apart from the space and it creates a dichotomy that settles in my chest like a kind of panic, like folding my hands with the fingers in the wrong place. For days now, I’ll be a drifter. A balloon whose string has come undone in a field with no wind, no trees. Soon enough, I’ll deflate back into complacency. But for now, I sit with snatches of inspiration tumbling through my head, the shadows of their speakers’ faces already fading into the forgetfulness of time.